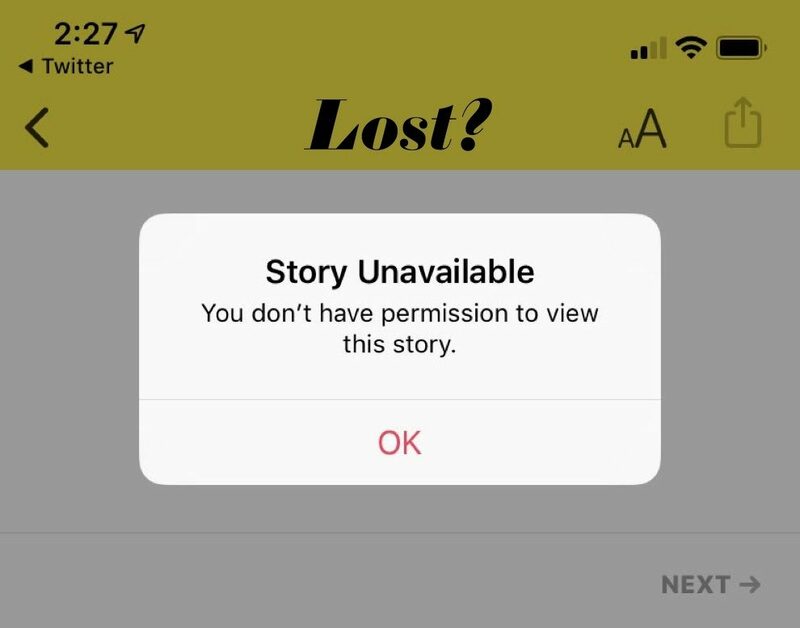 April 5, 2019, 10:28 a.m.
By Joshua Benton @jbenton April 5, 2019, 10:28 a.m.
Eleven days ago, Apple unveiled its premium news subscription service, Apple News Plus. And as I wrote at the time, it was kind of disappointing. Apple News Plus is based on Texture, a “Netflix-for-magazines” app built by the magazine industry — and thus structured to favor the default atomic unit of the magazine business, the individual issue. That’s fine, on a big-enough screen and when limited to the digital-magazine universe. But no one other than the magazine industry wants to be limited to the digital-magazine universe. I like Vox! It’s a smart site with smart ideas about editorial strategy. So when I heard a new product from them, “The Highlight by Vox,” would be included in Apple News+, I was interested! But then I tried to find it, and that was my big mistake. Maybe I should just scroll through the long News+ feed. I spy the @WSJ, also part of News+, but I go from top to bottom — no Vox of Highlight. I figured I’d search for it. There’s…no search field in the News+ tab. And none in the main News tab. Ah, but there’s on in Following? On the main Vox page, I scroll through all the verticals in the little carousel up top — no The Highlight. I decide to take to Twitter. A first search seems to indicate no one has talked about the damned thing in a week. But then I see it! A tweet from Vox writer @constancegrady linking to an Apple News URL. FINALLY! I see a story! It looks good! I see a The Highlight logo mid-article and think it might lead me to the mothership. Alas, it’s just an image. I go back to the main Vox page and…holy moly there’s @constancegrady’s story again. Just sitting there! Unmarked as premium! I looked back at @constancegrady’s tweet — she, my unknowing Virgil through these circles of Apple News+ — and I see her reply for the first time. It’ll all be free in a week anyway. Currently this link only works on phones or tablets, and it will take you to Apple New plus, which is behind a paywall. (First month's subscription is free.) But the piece will go up on Vox's main site in one week, and as always, that will be free to read. For the record, the lion’s share of the blame here goes to Apple, not Vox. (Versions of the same problems exist for all the other non-magazines in Plus.) Apple had a year to figure this out and they didn’t. (They also had a year to negotiate deals with publishers, but by all accounts, things were being thrown together at the last minute.) From working with Apple News’ backend in the past, I think Vox could take one valuable step on its own, putting all The Highlight’s content into a separate section. But that would still leave most of the UX contradictions in place. POSTED April 5, 2019, 10:28 a.m.